Seneca Steel sent a crew of seven men to a plant shut down in Indiana. 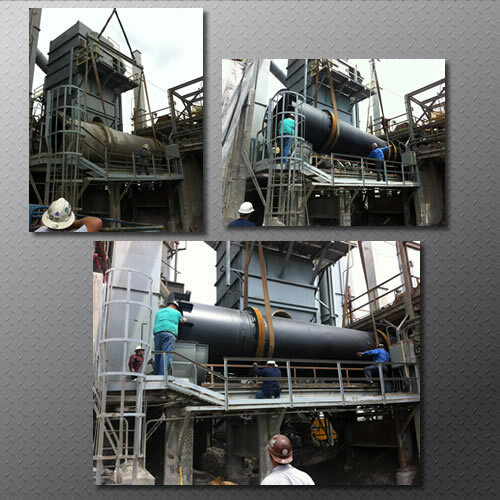 They worked round the clock in two twelve hour shifts until the job was completed repairing and maintenancing a huge dryer drum. This factory manufactures a product used in many glass products around the world, so downtime was a major concern. Our team removed the duct work, removed the dryers and installed all new trunions. They put in a new dryer, reinstalled the burner, lined it up and had it done 30 hours ahead of schedule. This was even after doing a lot of fabrication repair and helping other crews. According to Lee Campbell, "When we go on a project like that, it’s to get the job done. If another crew needs a little bit of help we jump right in and help." Getting the job done right and getting it done on time is the main goal. That's the type of attitude that keeps Seneca Steel customers satisfied with our work and keeps them coming back to us. This was a note we received after completing the job. "Lee and his crew from Seneca Steel Erectors managed to out perform any other crew of that type I have ever used. You have a great group of guys that were willing to get the job done. . . . Not only did we complete it ahead of schedule, but we did it without a safety incident. It was a pleasure to have worked with all of you and I am looking forward to doing it again in the future. GOOD JOB!!!!"